Well, here it is! The official 1.29 patch-notes list. I don’t expect everyone to read this entire list (which took me about a week to compile), so here’s the TL;DR: New hud, massive rebalancing for high levels of play, there’s now 10 tutorial levels plus 10 you can unlock later, easiest levels made easier, some new ability improvements, bug fixes, and also… Kissie Rats. Even more TL;DR is this: for this patch, we want to make the game easier for new players to dive into, and more fun for our serious players. That does NOT cover everything in these patch notes, but it should simply suffice to say that this would be most games’ “version 2.0“. It’s a huge overhauling of numerous systems in an attempt to fix some degenerate play while at the same time trying to become more inviting to new players. This patch took awhile, but hopefully when you guys get your hands on it, you’ll see where all that time went. You can also check out this podcast we recorded all about Version 1.29, starring the lead designer, lead artist, and two of our best beta testers. If you have any questions/concerns/comments about these patch notes, as always, please leave us a comment, either at the bottom of this post or at the Dinofarm Forums! You now start all games with four spells and four spells is the total. One of these is always an Ultimate spell. Explanation: Five spells was simply too many. Based on how power tiles work and what our kit of spells actually do, five spells made “combo-sessions” too strong and allowed players to be too lax about when they use their spells. On Easy mode, you have 3 spells that grab from a more limited pool. This is one of the many ways that the game is now easier to “dive into” for new players. New players will now only have to learn Gale, Blast, Snowball, Dash, Rotisserie and Jump – just 6 spells, down from 9. Easy Mode also grabs from a more limited pool of monsters – Curse Kids, Liches, Yetis, Gwenny, and Charles don’t show up at all in the mode, and Vargas only shows up on Stage 4. The limited spell pool, and limited monster pool for Easy Mode is a huge part of how we’re making the game easier to dive into. Initial reviews of the game were all super-positive, but with frequent jokes about “31 tutorials, holy cow!” This is part of how we’re able to reduce the number of tutorials. Stage 4 is now a super-hard Caves level with tons of monsters, licorice monsters and fewer power tiles. This is a big one, too. Having a “soft-cap” on the number of levels you’re going to see means that now levels 1, 2 and 3 really matter. “Surviving” isn’t enough. You now gain 1 Barrier per level (2 on Easy), but zero at the end of stage 4 and higher. We like giving the player back some Barrier at the end of a stage, because it obfuscates their true Barrier amount somewhat, thereby helping facilitate sacrifice plays. However, two points every stage was just too many. Further, cutting it off after stage 3 disables one type of defensive play. Monsters no longer activate the turn you reveal them. It takes them 1 turn to wake up now. This is one of the many things that I’ve wanted to do since day one, but we just never had time. We don’t want monster generation to be output randomness, where you see a monster and then they’re already in your face, the same turn you learned they existed. Now, you’re guaranteed at least one full turn to decide what to do about this Curse Kid before he slaps you with his Curse Pop. Candies no longer are slightly biased AGAINST the spells you have. We used to make candies-of-spells-you-have slightly *less* common than candies-of-spells-you-don’t-have – the reason for this was that you used to sometimes be in a situation where you only had one or two spells, and having duplicates in such a situation could be disadvantageous. The basic thrust of our monster changes were to make more monsters viable as tools for the player (see Jellies as a great example of that), make the easy-game easier, and make the hard-game harder. Kissie Rats are basically the opposite of Licorice monsters. While Licorice monsters are non-scoreable threatening monsters, Kissie Rats are non-threatening, scoreable monsters. They’re one of the tools we’re using to make Easy Mode even easier. Plus, they’re cute. Yetis no longer insta-kill-stomp the player. 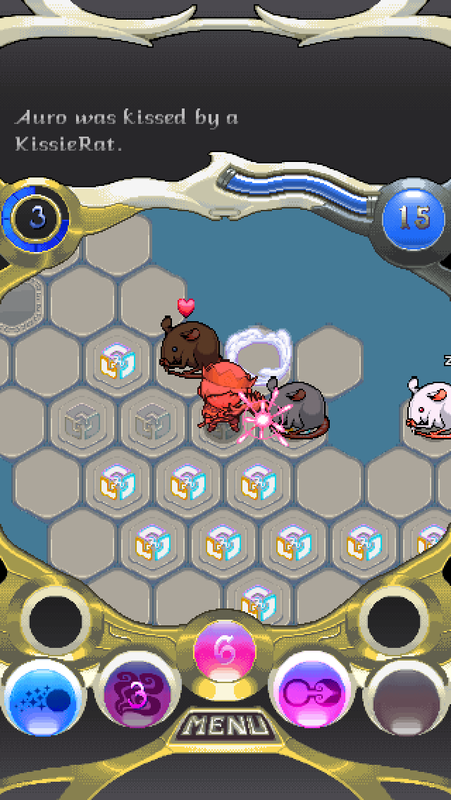 Instead, they have a move called “Suplex” which launches Auro two tiles in the opposite direction and dealing 1 damage. See visual representation here. We want to slowly phase out some of the “instant-death” game-deforming elements in the game. One of them was Yetis, which were both really prevalent, and also game-flattening. Having a Ready-Yeti nearby meant that those spaces next to him might as well be pillars – they are 100% absolutely-no-go zones, shrinking the possibility space too much. We realized that Yetis being completely unkillable, doing 1 (possibly 2) damage is probably good enough to put a fire under players. Bats no longer move a second time if their first move brought them adjacent to you. This is just another attempt to reduce the unpredictability in the monster movement. We have more work to do here, for sure! Curse kids now have a 1 turn cooldown on their attack. In our testing we’ve found that actually Curse Kids weren’t much more threatening than Rats. This is because most players simply kill them off before they come off their initial cooldown, being that they are Normal type monsters. Brute attack now deals no damage, only bounces you. No one was ever getting hit by Brutes before, for reasons we don’t completely understand. I think it’s probably because they’re single actors and they have a “no-tricks” style of attacking; basically, they attack and move just like rats, except there’s only one of them. With this change, we’ve made Brutes more of a T1 monster, tactically threatening (you could land in the water), and more of a useful “tool monster” that you can actually use to your advantage. We actually tried some drastic spell changes during the creation of the patch (like removing Ultimates completely!). In the future, we’re looking at tweaking Rotisserie, Blast, and possibly Dash. We’d also love to add some new spells if we can come up with some more great ones! For now, here are the changes we have, which are directed at increasing tactical diversity. Abomination now has the same “Suplex” abilility that Yetis have (see above). Its duration has been reduced from 6 to 4. Abomination in general is a kind of complicated ability, and the fact that it uses similar art to the Yetis has always made me want to give them the same ability, to make things go down smoother. This change really makes Abomination pretty different from Floe and Snowball, which were both kind of similar to the old Abomination attack ultimately. 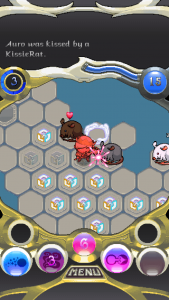 Snowball no longer knocks enemies backward a tile; instead, it adds floe to their tile. Its cooldown is now 3 (down from 4), and freeze duration increased from 6 to 7. Snowball was one of the most “automatic” and flat abilities in the game, with the pushback. Also, it sometimes worked a bit randomly, as you could use it on a monster who was three tiles away to push them to the fourth (and not-visible) tile (is it water? Roll the dice!). Now, Snowball is much more of a tactical “tool” that you use in concert with other abilities. You’ll now find yourself freezing a monster just to “take him out of the fight for awhile”, which is a lot more interesting than as the insta-kill “gun” move it was before. This is a big one! For details on this, please read this article. The Combo Meter now yields 1, 3, 4 and 5 points (up from 1,2,3,4). The 1-point level is 2 points on Easy Mode. The Combo Meter now has 8, 8, 6 and 4 pips for each combo level respectively. At the 4 and 5 point levels, the combo pip drain is twice as fast. The general thinking with these changes is that we needed to support our new changes (4 spells, for example) as well as reinforce the actual goal of the game, which means making the brashness bar more visually apparent. We also wanted to take the opportunity with some text-feed improvements to use that top area a bit more and bring more personality to the game through Argo, Quillsh and monster conversations. Blake has an article coming soon about the new HUD, but the main goal here was to make the Brashness Bar – the object of the game – more visually prominent. Also the HUD changes support the four-spells-instead-of-five change. Expect more HUD changes in the future. Significant Text-Feed improvements. You can now click on the text feed area to get a log of the recent events. Stage 1 now always has the Cellar tileset, Stage 2 is the Dungeon, Stage 3 is the Sewer, Stage 4 and on is Caves. The tileset used to be randomly chosen. Note that this is only a visual change. Some small circular “dazed” graphics appear over actors who are stunned. We’re still working on this kind of thing, but in general we realize that there needs to be more feedback for this kind of stuff. Sleepy Z’s added for actors while they are asleep. Now that you actually see actors asleep sometimes (a lot, if you jump or dash into them, since no turns pass), it’s important that this status is indicated. 4/5 pointers have a chance to provoke a new funny Argo conversation. New text feedback for hitting stage 4, getting 4-5 pointers, running low on health and more. Tutorial now split up into two sections, the second of which unlocks when you hit level 4. For details on these changes, read this article. Easy and Normal levels have one more rank each now. In short, this was done to smooth out the ranks. We still may not be quite there yet, please let us know your experience! No longer is “Master 2” just “Master 1” with a higher score goal – the game actually gets harder as well. This also allowed us to decrease the score-goal-rate-of-increase, which otherwise can get really out of control and penalize high-skill players with super-long games. Frozen fliers now move 1 tile from an explosion. Fixed a bunch of bugs with Troggle Charges. You now lose a pip at the end of every single turn. Before you didn’t on turns that you got kills or on turns that you touched a teleporter. A ton of other small bug fixes. If you’ve successfully made it through these patch notes: you may have a future (or present job) in game design! I hope you enjoyed reading these – I enjoyed writing them and there will be a lot more where this came from in the future. This is still just the beginning for Auro! Stay tuned – and thanks again for being a fan. Special thanks for help with this patch goes out to: Nachtfischer, Vivafringe, Senator, Major_Shiznick, Disquisitor Sam, and the other testers. If you’d like to come join up as a tester, join the Dinofarm Games Forums and PM me there (user “keithburgun”). Dinofarm Games has GONE EVIL!